February 11, 2011, 1:26 a.m. It may have been cold and snowy so far this winter, but Americans are just as likely to believe in global warming as they were a year ago, according to the latest Economist/YouGov Poll. 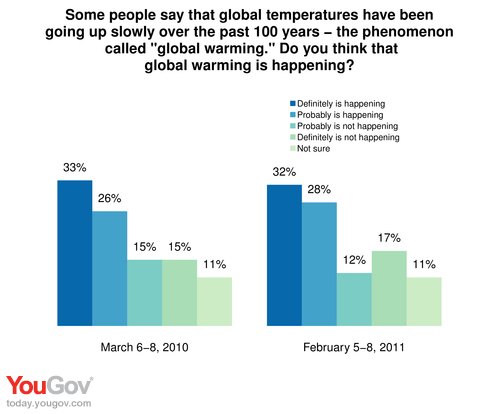 60% say global warming is happening, about the same as the 59% who said so last March. 29% this time, and 30% last year, said it was not. But belief in global warming is partisan. Democrats believe in it, by a margin of 84% to 6%. So do independents, 62% to 30%. But Republicans don’t—and by two to one. Just 29% of Republicans say global warming is happening, while 59% say it is not. In fact, 41% of Republicans say global warming definitely is not happening (Overall, 17% think that). As for this season’s cold weather, 57% of Americans say that’s something that just happens occasionally. Only 33% attribute it to climate change.